John: Welcome to the Character Strong Podcast, where we have conversations on school culture and leadership. 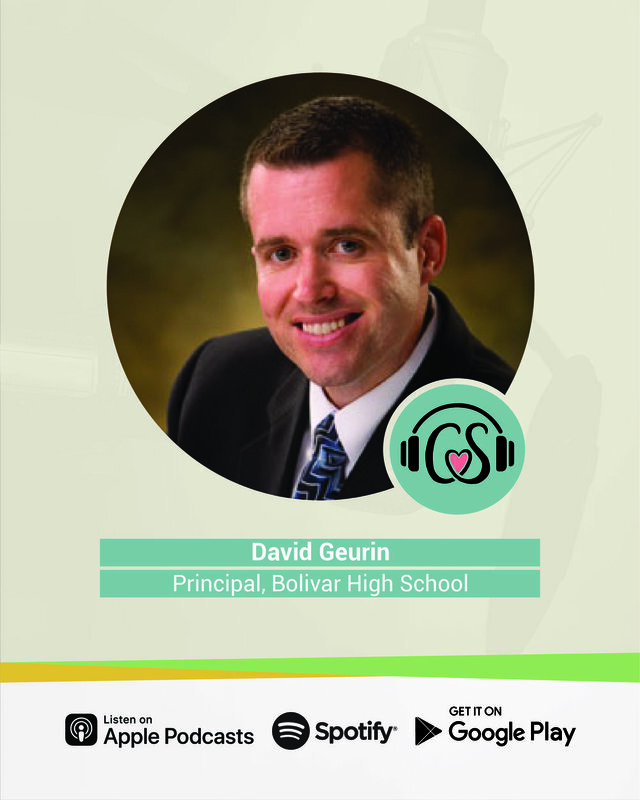 We're excited to kick off a five part series today with David Geurin of Bolivar High School, the Liberators, a National Blue Ribbon School in Bolivar, Missouri. He is a National Digital Principal of the Year, a speaker and author of the book Future Driven: Will your students thrive in an unpredictable world? Are you ready? Let's get character strong with David Geurin. John: Alright, thanks for joining us today on the Character Strong Podcast, David. It is an honor to have you with us, I've been looking forward to this for a while. David: Hey, it's great to be with you John, on the show. This is a good time to connect and I'm excited to be here. John: Thank you. I mean, I was drawn to you. We met, I think the first time at the National Principals Conference, where your name was well known and I got to talk to you, learn about you, since that time I've read your book, Future Driven, was so impressed by it, inspired by it, I think it's something that all educators in and outside the classroom need to be reading. Then even had the opportunity to come to your school which was a huge honor, to see the work that you were doing and meet your amazing staff. John: You wrote a blog for us recently and I thought, what a great opportunity it might be to take some of the pieces from that blog and have some short conversations about it over a four or five part series here, so I'm just gonna dig right in. One of our goals with these is that we kinda cut the fluff and get right to the stuff, and that important things that we know, that we're all going after and grappling with. So one of the points that you made in your blog was number one, relationships are the foundation of everything we do as educators. Kids will learn more in classrooms where relationships are nurtured. John: We always say that it's all about relationships at the core of our work, so tell me just to start, a little bit more about that first reason, and why you put it as number one. David: Well I think there's a lot of reasons why relationships are so important in the work that we do. Part of it is that learning is just better when it's a social enterprise, when it involves connecting with others and building meaning together and things like that. But we also want our schools to be places of connection, belonging, and acceptance. We just want to help our students be well-rounded individuals, they're not simply test takers and future employees. They are people who have hearts, and we want to get to know their hearts. John: That's wonderful. Yeah, I think about, yet ever school's going to probably ... and I love getting a perspective from you as a principal leading this work in a school, and yet all the pressures that we get as a school system on that academic side, how do you do this with the knowledge that relationships are the foundation of everything, right? John: How do you balance that? Like how do you help your staff? How do you approach that as a principal? To make sure that we are focusing on that area that we know is most important but easily can get forgotten? David: Yeah, it can. It's something that I think we know but we take for granted, or we assume that our relationships are fine or they're going well in our schools. I used to chase a lot of other things that you're taught to chase in your graduate classes and whatnot as you become an administrator. And then I just came to more and more of the realization that a lot of those things really take care of themselves if we are being very, very intentional with the kind of experience that everyone's having, not just the students, but our teachers and our staff, all the people that work in the building and learn in the building. When we are really tuned in to trying to create the best possible environment for them relationally, then it just makes everything go so much better. David: Not that there's not still problems, because there are, and not that learning just automatically happens, because it doesn't. But man, if we get that foundation right, and we really focus more of our attention on that, then it does create an environment I think that makes learning much more powerful. John: Absolutely. Well my guess is that as a principal, you're in classrooms a lot and working with, supporting teachers. There's gonna be a lot of educators that listen in to this, people that are in classrooms all over the country. What would be a tip that you would give someone who gets ... I would even say the honor of going in and watching educators work regularly with students, and you probably see a lot of great things that are in action. What is a tip or two that you would give to a classroom teacher when it comes to putting more of a focus on the nurturing of relationships? Practical things that you've seen that are just ... maybe low burden but high impact. David: Sure. Yeah, really it doesn't take a lot of extra time to just notice things that people do that are going above and beyond ... or just doing good work, or their gifts or their strengths. So as I'm out and about, I'm trying to notice teachers for quality things that they are doing, their attempts to make learning better for them when they're trying to connect with others in the building, trying to encourage that. And provide encouragement also, to teachers and students. David: Sometimes that's just a word. Sometimes it's note writing, that's something that we try to do quite a bit is writing positive notes to each other to encourage. You just never know when that note might come at a time when someone's having a rough day and they need that little boost. So today a thing that I did was I had these chocolate bars that were from a fundraiser that were left over, so I just started writing notes to students this morning, wrote a few of them and I actually gave them two chocolate bars. And I said, "Hey, I'm just giving you this because you're awesome and I want you to pass the other one along to someone you think's awesome and tell them you think they're awesome also." David: So I just called a few students in, and I was intentional about the ones that I chose, that I felt like that would be a good boost for them. It helps build that relationship, that connection between me and the students also. John: Well said, and I love just even that idea of ... I mean, we set the tone. In whatever leadership role we are in, we all are leaders in our building, so it may be as a principal, it may be as a teacher leader. Whatever it might be, but we set the tone with that example. I guess the question I would ask, you get bombarded, my guess is, with so many things just like everybody else. But do you find that it takes a disciplined practice to make time for things like that? Where it's, "I've got some candy bars here that are left over," and then that thought is, "I'm going to write some notes." And how many times that doesn't happen though, because there are so many other things that seem to be so pressing. John: Have you found that it has just become a habit for you? Or do you have to be extra intentional about making time and/or putting the time in your schedule? I mean, how do you balance that as a principal? What tip would you give to a principal who balances so many things from above them, all that stuff? David: Your time can become ... I mean, everyone else can control your time or you can control your time. I think it's really a matter of you have to carve out spaces, make sure that you're intentional with things that are going to help you to be that positive leader in the building that you want to be. So hey, everybody does morning announcements probably, but every morning I'm doing morning announcements to try to set the tone for the day. And they're not just ... you know, "Here's what's happening," it's leadership, it's trying to set a tone with a positive message. I tell a joke every morning on the intercom. David: We greet our students every morning when they come into school. That's a huge thing for us. We want our teachers greeting our students every time when they're coming into classrooms. So we're trying to be very intentional. We set aside time during our faculty meetings, first five minutes we write notes to each other and also to students, of encouragement. David: So that carves out that time, because they're busy, they don't have time. David: Well here, we've carved this time out for you so you can be intentional with that. I've done a thing where I do envelopes for every teacher in the building at the beginning of the year, then I know that as I work through the year, every one of those envelopes has to go out to them with a note of encouragement. So that way I'm intentional to make sure I'm getting through everyone and everyone's getting ... you know, getting noticed. David: Because hey, we want to feel like ... hey, appreciation has been shown in studies, I don;t have the studies at the tip of my fingers, but to be more powerful of a motivator even than more money. David: So you know, that ... and when people feel that, when everyone feels appreciated they're more likely to pass that on to others. And they're more likely to handle that difficult situation with a student with grace and with an ease than if they're ... yeah. And so all this I think just, you've got to work on your culture as a leader. It's something that you've got to ... and you've got to help activate other people in that also. And it just kinda has a tipping effect almost, eventually you look around, you're like, "Man, I am so thankful for where our building's at and the way that we care about each other." It feels very ... it feels like a blessing. John: Well said. Well said. Well the things that mean so much in that last piece of even just the practical ideas you were sharing, but things that stood out. Just that idea of how intentional you are, and I think that is a big concept. Are we intentional? And constantly thinking about how we could be more intentional. I heard in there, something that stood out was the making time for your teachers to be able to do this. So taking time that you have with them, making time, so using some of that time you have to give them time to do these things that put a focus on relationships, because that says something about what is most important. John: And then I just think about the consistency piece and how important that is that we are consistent with this work. It's not just once a month or we had an assembly once, but there are things that are consistent in that approach. John: Well, as we close down, just the first part ... and we'll be back right after this with a part two, right? That we want people to listen in to and continue this conversation, but on the concept of relationships, nurturing relationships, that it's the foundation, when you think about you joining education, going in to education, who did it for you? Was there somebody? Was it your parents? Was it a teacher? If there was someone whether came to mind, who was it that really did relationships well that encouraged you and/or influenced you to want to go into education? David: Well there are many, there's no question about that. But I always tell the story of one of my coaches. I was actually just a freshman, brand new in a school ... I was in three different high school during my high school career, so kind of moved around quite a bit. But was not feeling very plugged in to the community, really, and wanted to play basketball, because that was important to me. I didn't know if I'd make the team or not, because I wasn't very good. David: But I remember that he just gave me some encouragement. He was the head coach of the team and he didn't really need to, but that word of encouragement, even though I could do really nothing for him, it meant so much to me and I've never forgotten that. I had the chance to call him a couple years ago and just thank him for that, and it definitely made me want to do that for others, just to try to be an encouragement in the lives of students, and recognize that even little things, eve a little comment can help put somebody on a different path and feel more confident and more able to reach their potential. John: Well thank you. And part one of this multi-part podcast. Just thank you for reminding us that relationships are the foundation of everything we do as educators. Thanks for being with us, David. David: Thank you John, it's great to be with you. John: Thank you for listening to the Character Strong Podcast. If you enjoyed this episode, feel free to share on your social media. Please rate, review and make sure to subscribe for future episodes on Spotify and iTunes. Thanks for listening. Make it a great day.